I received an advance copy of this book in return for an honest review. Marcus Sedgwick is a very unique and interesting writer. He can take the seemingly ordinary and somehow make it feel extraordinary. While his previous work Midwinterblood had fantasy elements, She Is Not Invisible is straight contemporary told from the point of view of Laureth, a blind teenager, who fears something very bad has happened to her father. Even with the straight forward settings of London and New York City, there is a mythical shimmer of something not quite real world on top of the story simply by Sedgwick’s manner of writing. Laureth “borrows” her precocious 7-year-old brother and her mother’s credit card after her fears about her father went unacknowledged by her mother. With the help of her brother, she navigates from her London home to New York City with no clue on the whereabouts of her father other than an email from a stranger claiming to have found his notebook. The major plot points are secondary to the journey Laureth and her little brother takes. Though she is blind, Laureth has developed as many secret talents as possible to hide her disability from the wider world. Just reading how ingenious she is in fooling the world and how cruel people can be to strangers was a fascinating glimpse at what those will disabilities face on a daily basis. Laureth is an incredibly independent character while having to remain frustratingly dependent on others in many situations. This is the first real time she’s been “on her own” and fending for herself, though she has put on the added responsibility of protecting her younger brother by bringing him along. Due to that previously mentioned “mythical shimmer” element of Sedgwick’s writing, I expected a turn into the fantastical at any moment, but was completely satisfied when nothing magic or unrealistic came into play. It’s a story of misunderstandings, coincidences and what we do when we believe those we love are in danger. The climax of the story is incredibly satisfying with Laureth using what everyone else sees as her faults to protect herself and her brother from imminent danger. 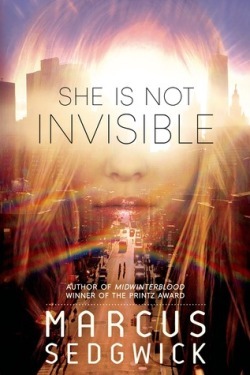 She Is Not Invisible is a short, fast-paced book that is gripping in its drama and compelling in its humanity. Laureth is a unique and unexpected heroine that had a solid head on her shoulders while still being young and ignorant to the greater world. This is a lovely short book that deserves much more attention. I received an ARC of this book from the publisher. All opinions are my own.